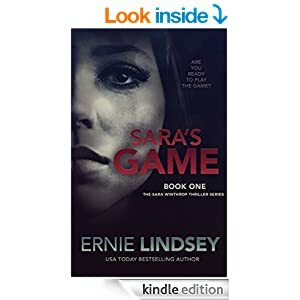 I downloaded Sara’s Game (The Sara Winthrop Thriller Series Book 1) by Ernie Lindsey last week and read it in one day. As the reviews promised this is a grab you and not let go thriller. To enjoy this book all you must do is, sit back, and suspend belief for one lazy summer afternoon. But, isn’t that just plain ole good fiction? I mean when was the last time you attended a Quiddich match at Texas Stadium? Or fell in love with a vampire, or watched a drop dead spy hang from a helicopter as he killed the villain? And one thing I think we can all agree on is that no Werewolf and human should mate. So it shouldn’t be that hard to believe a mom would move heaven and earth, fight the devil himself, thwart the police and defeat a sociopath to save her three children. Yes, good fiction can allow the reader suspend logic for a few hours and believe the unbelievable. And Mr. Lindsey did that for me. Let’s face it, what could be more terrifying than a missing child? Maybe three missing children and a missing husband… . I enjoyed this fast, quick read and left the logical side of my brain at the door and went along for harrowing ride where for once the heroine defeats the psycho. So if you’re looking for a book to read as you curl up pool side this Saturday download Sara’s Game while it’s FREE.